FIGURE 11.18 Flow characteristics of opposed blade dampers. The parameter a is the ratio of system resistance (not including the damper) to damper resistance. An approximately linear damper characteristic is achieved if this ratio is about 10 for opposed blade dampers. (2002, 2003, 2004), and Tao and Janis (2005). The illustrative systems in this section are drawn in part from the first of these references. In this section, seven control systems in common use will be discussed. Each system will be described using a schematic diagram, and its operation and key features will be discussed in the accompanying text. 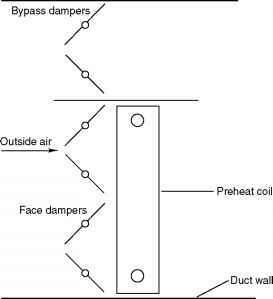 FIGURE 11.19 Face and bypass dampers used for preheating coil control. FIGURE 11.20 Outside-air-control system with economizer capability. 1. The fan control system turns on when the fan is turned on. This may be by a clock signal or a low-or high-temperature space condition. 2. 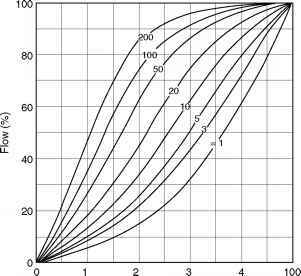 The space temperature signal determines whether the space is above or below the setpoint. If above, the economizer feature will be activated if the OA temperature is below the upper limit for economizer operation, and will control the outdoor and mixed air dampers. If below, the outside air damper is set to its minimum position. 3. The discharge air PI controller controls both sets of dampers (OA/RA and EA) to provide the desired mixed air temperature. 4. When the outdoor temperature rises above the upper limit for economizer operation, the outdoor air damper is returned to its minimum setting. 5. Switch S is used to set the minimum setting on outside and exhaust air dampers manually. This is ordinarily done only once, during building commissioning and flow testing. 6. When the supply fan is off, the outdoor air damper returns to its NC position and the return air damper returns to its NO position. 7. When the supply fan is off, the exhaust damper also returns to its NC position. 8. Low temperature sensed in the duct will initiate a freeze-protect cycle. This may be as simple as turning on the supply fan to circulate warmer room air. Of course, the OA and EA dampers remain tightly closed during this operation. FIGURE 11.21 Preheat control system. Counter flow of air and hot water in the preheat coil results in the highest heat transfer rate. 1. The preheat subsystem control is activated when the supply fan is turned on. 2. The preheat PI controller senses temperature leaving the preheat section. It operates the face and bypass dampers to control the exit air temperature between 45 and 50°F. 3. The outdoor air sensor and associated controller controls the water valve at the preheat coil. The valve may be either a modulating valve (better control) or an on-off valve (less costly). 4. The low-temperature sensors (LTs) activate coil freeze protection measures, including closing dampers and turning off the supply fan. Note that the preheat coil (as well as all other coils in this section) is connected so that the hot water (or steam) flows counter to the direction of airflow. Counter flow provides a higher heating rate for a given coil than does parallel flow. Mixing of heated and cold bypass air must occur upstream of the control sensors. Stratification can be reduced by using sheet metal air blenders or by propeller fans in the ducting. The preheat coil should be located in the bottom of the duct. Steam preheat coils must have adequately sized traps and vacuum breakers to avoid condensate buildup that could lead to coil freezing at light loads. The face and bypass damper approach enables air to be heated to the required system supply temperature without endangering the heating coil. (If a coil were to be as large as the duct—no bypass area—it could freeze when the hot water control valve cycles open and closed to maintain discharge temperature.) The designer should consider pumping the preheat coil as shown in Figure 11.19d to maintain water velocity above the 3 ft./s needed to avoid freezing. If glycol is used in the system, the pump is not necessary, but heat transfer will be reduced. 1. During operation the discharge air sensor and PI controller controls the hot water valve. 2. The outside air sensor and controller resets the setpoint of the discharge air PI controller up as ambient temperature drops. 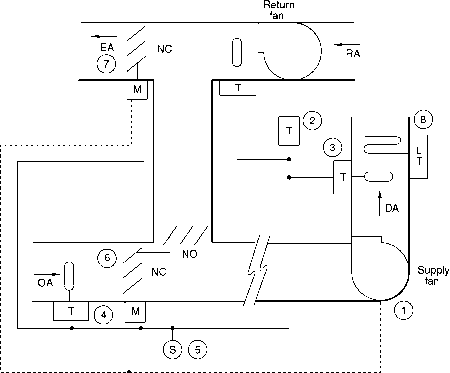 FIGURE 11.22 Heating-coil control subsystem using two-way valve and optional reset sensor. 3. Under sensed low-temperature conditions, freeze-protection measures are initiated as discussed earlier. Reheating at zones in VAVor other systems uses a system similar to that just discussed. However, boiler water temperature is reset and no freeze protection is normally included. The air temperature sensor is the zone thermostat for VAV reheat, not a duct temperature sensor. 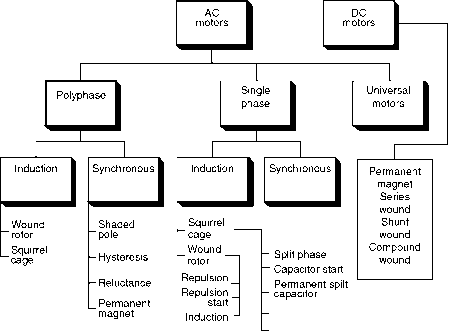 Figure 11.23 shows the components in a cooling coil control system for a single-zone system. Control is similar to that for the heating coil discussed above, except that the zone thermostat (not a duct temperature sensor) controls the coil. If the system were a central system serving several zones, a duct sensor would be used. Chilled water supplied to the coil partially bypasses and partially flows through the coil, depending on the coil load. The use of three- and two-way valves for coil control has been discussed in detail previously. 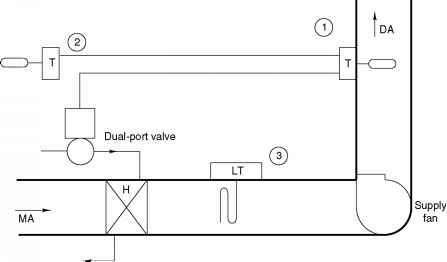 The valve NC connection is used as shown so that valve failure will not block secondary loop flow. 1. The coil control system is energized when the supply fan is turned on. 2. The zone thermostat opens the two-position refrigerant valve for temperatures above the setpoint and closes it in the opposite condition. 3. At the same time, the compressor is energized or de-energized. The compressor has its own internal controls for oil control and pumpdown. 4. When the supply fan is off, the refrigerant solenoid valve returns to its NC position and the compressor relay to its NO position. At light loads, bypass rates are high and ice may build up on coils. Therefore, control is poor at light loads with this system. How to determine economizer upper limit in energy plus? How to know if a damper is closed or open on an hvac plan? What is face and bypass damper? How to control face and bypass damper?